Time Lapse Bot was quite proud to be called into service to help create this time lapse video of the process of assembling and lighting the Christmas Tree at The Pfister Hotel in Milwaukee, Wisconsin. I realized that I never got any good photos of Time Lapse Bot 3. I’ll have to schedule a session and get some shots… We’re also planning a series of upgrades for Time Lapse Bot, with the goals of: better mobility, better picture quality, and more interesting time lapsing abilities. 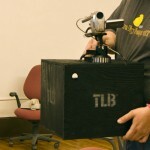 2011 should be the quite the year for Time Lapse Bot technology. If you’d like to have Time Lapse Bot capture one of your events, get in touch with me. Posted on Monday, December 13th, 2010 at 7:00 am. Subscribe to the comments feed. Both comments and pings are currently closed. Post on your own blog. So cool the Time Lapse Bot was able to capture our Christmas Tree being put together! He will have to come back next year and do it again!